Home / Falcons / AWCON 2018: Super Falcons, Banyana Banyana in "last fight"
AWCON 2018: Super Falcons, Banyana Banyana in "last fight"
With one more day left at the AWCON 2018, there are still a few more hurdles for teams to cross. Starting with the third place match which decides who picks the final World Cup slot for CAF zone, Cameroon face Mali at the Cape Coast stadium, 4pm local time. Having lost out on penalties painfully to Nigeria in the semifinal, they look favourites to clinch the final ticket. Mali on the other hand have been the surprise team of the competition so far as they managed to reach the seeming final. For Joseph Ndoko, no more wailings for their loss to Nigeria. It's a new focus for the team. “Right now we have to quickly adapt to our new target of qualifying to the FIFA World Cup. The crying time is over. We need to get to the next stage so the girls have been sensitized on what is ahead of us. The outcome will be decided on the field,” Ndoko said. Mali's Gaffer, Mohamed Saloum ahead of the match confesses that his team is better organized now with the sole aim of picking the final World Cup slot. Fast forward to the next day where Nigeria will be on display against a well prepared South Africa side. Waiting this long to pick a World Cup ticket for the first time in 27 years is great joy and Desiree Ellis agrees with her captain on making history twice in the same competition. For South Africa's Chrestinah Kgatlana, it's time to challenge Nigeria's dominance on the continent. "It's a blessing for us that we are in the final. It's about time we challenge Nigeria because they've been dominant on the continent. We challenged them in the first game, won it and now they know that South Africa will give them a tough game. “We've achieved our World Cup aim so the pressure is on Nigeria to win the title, not on us so we are just going to the game to enjoy,” Kgatlana said. 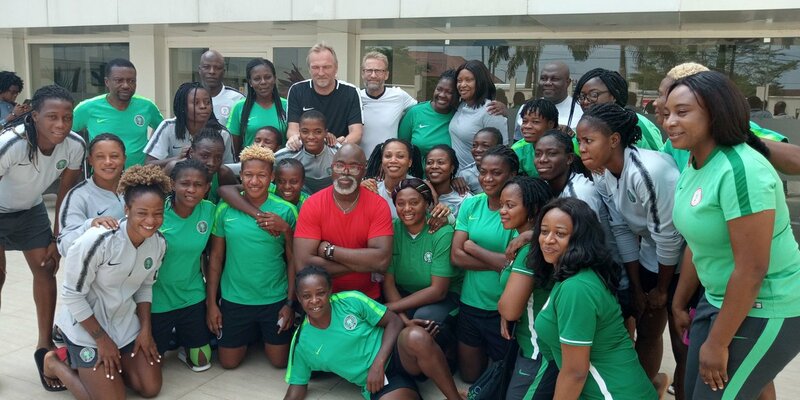 Boosted by a double match bonus ($10,000) announced by the NFF president, Amaju Pinnick, the Super Falcons of Nigeria are not giving anything to chance either. "Watching you play against Cameroon, I believe you should earn more because you truly deserve it. You win the final, I'll double it for you," Pinnick said. In response the two captains of the team Rita Chikwelu and Onome Ebi promised the trophy not just as a birthday gift for Pinnick but also for Nigerians. "Come on Saturday, we will do our best to give you a wonderful 48th birthday gift,” Rita Chikwelu. “We promise you and Nigerians that on Saturday we will go out as Lions. We will not only beat South Africa, we will also make them understand that we are better and real champions," Onome Ebi said. The Super Falcons also got pep talks from the Nigerian Ambassador to Ghana Ambassador Olufemi Abikoye as he paid them a visit at their training ground on Thursday evening. Abikoye promised to celebrate with the team at the Nigerian house in Ghana after they win the trophy. For South Africa, they'll be missing the services of Vice Captain Refiloe Jane who has returned to her Australian club, Canberra United. "It's sad I won't be in the final against Nigeria even though a part of me wants to stay but a part of me still needs to go back to my team who are doing poorly overseas," Jané said. For Nigeria, the likes of Desire Oparanozie and Rita Chikwelu had knocks in the Cameroon game. Faith Ikidi is also a doubt for the game since picking up an injury in her team's second group game against Zambia. The Nigeria versus South Africa game holds at 4pm local time (5pm Nigerian time) at the Accra sports stadium in Ghana.